I was so excited for the chance to review GONE Insect Repellent bands recently!! The bugs around here are awful, ever-present, and love to eat me and my babies. I hate using bug spray on me, and especially them, so I am always looking for alternatives. So, I was incredibly pumped when I found the GONE insect repellent band. 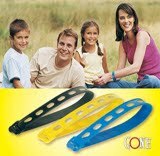 You just hook these nifty little bands to your wrist, ankle, stroller, whatever, and you're good to go. What's so special about the GONE band, you wanna know? Get this. It's all-natural. For real. The vapors inside the plastic band are made up of 100% Natural essential oils, such as peppermint, and lavender. No chemicals like in regular bug sprays, No DEET, none of that. Just natural essential oils. I think my favorite part about the GONE band is that it lasts up to 120 hours. Each band! How do you save the band for future use, you're asking??? Easy.. It comes with a resealable pouch to put the band back in when it's not in use! Awesome idea! The super sweet people at GONE, sent us 8 (EIGHT!!!) GONE insect bands to try. I was so excited to use them. We snapped one right on the Bean's stroller and went for a walk down the road by our house, which is pretty much in the woods. Success! No buggies! Then, I wanted to test out the water proof claim. I wore a band on my wrist while we went swimming, and only one tiny bug bite, on my other hand. Impressive, considering they usually eat me alive while I'm in the pool. I am very impressed with the GONE band, and will continue to use, as well as recommend it in the future. If you wanna check out the GONE band for yourself, or order one, go here.